I have a mint copy of this version for sale. If anyone's interested, please get in touch! By the way, I have the Chicago Tapes and Unreleased Demos in mint as well! got mine in a convention a few mounth ago for 45€, mint and sealed. The seller had 2 copys for sell. don't buy it for more ! Sound perfect, great copy of the original. Is it really that hard to reissue this? Come on Billy! I wanna hear this amazing album on vinyl, with this tracklist, but not for $200-400! I just got my copy a few months ago. Brand new. No surface noise problems at all like some have reported, so it must be fixed! It sounds FANTASTIC!!! Great pressing!!! I have original pressings of all SP LP's except this, and I'm pretty happy with having this in my collection! Just got my hands on the 4LP EU-Version and while I stil find this one too expensive (I really don't need this fancy deluxe stuff) the pressing quality and sound of the remaster is just awesome. Though I must admit, that the album has lost (to me) some of the magic over time. The album is just too long and there are definitely some filler that I don't really need. My favorite album will always be siamese dream. 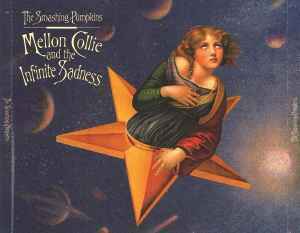 I just got the repress of 2012, USA version of the The Smashing Pumpkins ‎– Mellon Collie And The Infinite Sadness 4x LP Vinyl Reissue. I got it off ebay; initially told it was the EU/UK version. Ah, well ..... As all have said, beautiful vinyl, nice packaging. For Zero, i do her the IGD that many others have fedback about. However, it is ONLY in the penultimate 30 seconds, when Billy Corgan is screaming his vocals - that i hear the IGD / distortion bit. The last part of the song, the last line when he sings the line "She's my one and only" , that sounds Perfect, with NO IGD ! ... It is my understanding that, if there is IGD, it should get worse closer to the label the stylus goes, or remains the same, not get better. So, how come the vocals in the last line - sang 'acapella' with no backing guitars - sounds great with no distortion, whereas the earlier vocals are distorted ? is it because of the loud guitars affecting the vocals and hence the grooves ? or, because it is mastered 'hot'/'loud' ? And, yes - my TT and cartridge and stylus are properly aligned and tuned, etc. - other records with minimal dead wax have no issues. Sorry , i know my description is not very technical ! . Thanks in Advance. I just got the repress of 2012, USA version. I got it off ebay; initially told it was the EU/UK version. Ah, well ..... As all have said, beautiful vinyl, nice packaging. For Zero, i do her the IGD that many others have fedback about. However, it is ONLY in the penultimate 30 seconds, when Billy Corgan is screaming his vocals - that i hear the distortion bit. The last part of the song, the last line when he sings the line "She's my one and only" , that sounds Perfect, with NO IGD ! ... It is my understanding that, if there is IGD, it should get worse or the the same, not get better. So, how come the vocals in the last line - sang 'acapella' with no backing guitars - sounds great with no distortion, whereas the earlier vocals are distorted ? is it because of the loud guitars affecting the vocals and hence the grooves ? Sorry , i know my description is not very technical ! . Thanks in Advance. I have a spare copy of this if anyone is interested? ?